The bulk carrier Antaios was abandoned in South Atlantic on 860 nautical miles west off Cape Town after fire and water ingress in engine room. The vessel was en route from San Lorenzo, Argentina to Durban, South Africa, but caught fire in engine room due to overheating of the diesel generator. The fire was extinguished, but caused sufficient damages of the vessel, which started getting water ingress in engine compartment. The crew was unable to get control over the water ingress and Master sent distress signal, requesting immediate evacuation. The very large ore carrier NSU Inspire responded to the distress call and rescued the 19 crew of the sinking vessel. The people were disembarked at the Cape Town without reported injuries. 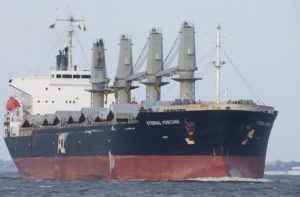 The salvage of the drifting troubled bulk carrier Antaios is not yet contracted. The condition of the vessel is unknown, but probably disabled in South Atlantic with partially submerged stern. The shipowner is in negotiations with salvage company for towing the vessel to South Africa, but contract is not yet signed. Fortunately during the accident there were no injured people. The bulk carrier Antaios (IMO: 9196383) has overall length of 169.00 m, moulded beam of 27.00 m and maximum draft of 7.50 m. The deadweight of the vessel is 27,776 DWT and the gross tonnage is 18,095 GRT. The Liberia-flagged ship is owned and managed by the Greek company Amalthia Marine. The bulk carrier Antaios was built in 1999 by Naikai Shipbuilding Setoda Factory in Japan.